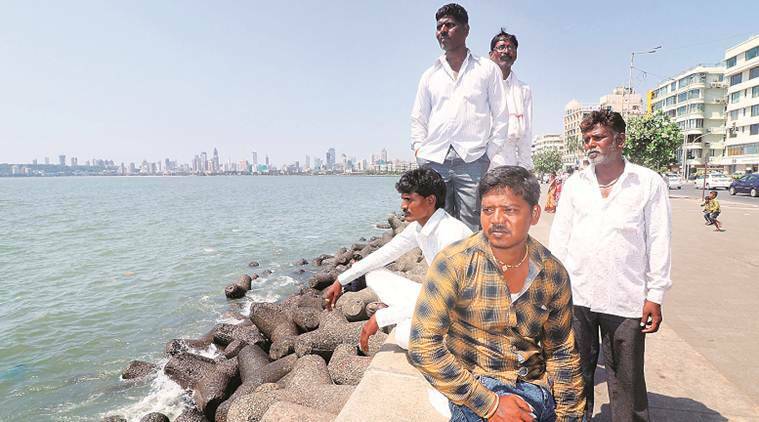 On Tuesday, the humidity in Mumbai was 78 per cent, but on the almost deserted Marine Drive promenade after 2 pm, under the unkind April sun, six men stood staring at the glistening water. Few words were exchanged and once they had taken in the sea breeze, they stood against the city skyline posing for pictures with their families. “Now I feel light. I feel free,” said Ambadas Shinde. Ambadas was among the group of 21 adults and eight children who had started their overnight journey of more than 400 km from their villages in Jalna and arrived in Mumbai on Tuesday morning by train. “Until a couple of months ago, I could have never imagined that I would get to see the sea in my life. I feel so much better now,” said Bapu Shinde, covering his head with a handkerchief. The six men spent 13 years on death row after first being convicted in 2006 of the murder of five members of a family in Nashik in 2003. In an unprecedented decision, the Supreme Court not only set aside their conviction and death sentence on March 5, but also ordered the Maharashtra government to pay compensation of Rs 5 lakh to each of the six men, recently released from the Nagpur Central Prison where they were lodged in the Phansi Yard. The six men — Ambadas, Bapu, Rajya Shinde, Raju Shinde, Suresh Shinde and another member of their family who was later held to be a juvenile at the time of the offence by the court — were reunited with their families in Jalna last month after years of incarceration. The wait was for Raju. While the juvenile accused was released from prison four years ago, three others returned to their families in Bhokardan, and Suresh came home to his family in Mantha, also in Jalna. Raju, who came home a week ago, was in prison longer than the others as he was wanted in another case in Buldhana. He returned home after being released on bail in that case. “We had decided that we would come and thank our lawyers after Raju came home. But even our family members wanted to come and say thank you,” said Bapu. The men, who arrived at lawyer Yug Chaudhry’s office on Tuesday morning, stood in a single file and gave roses to Chaudhry and lawyer Ragini Ahuja, who worked on their case. The group along with extended family members belonging to the nomadic Vadar tribe, camped in Chaudhry’s office with their humble possessions in small cloth bags. Suresh Shinde brought his wife, two children and mother to Mumbai along with him. “What I left behind in my village is a small heap of our measly belongings. We have to start building our lives from scratch,” he said. His 14-year-old son does not go to school, he had to give up his education as his mother travelled from one village to another in search of work, mostly in sugarcane fields. Members of the Vadar nomadic tribe often travel, taking up odd jobs like breaking rocks, desilting of nullahs, working on construction sites, in agricultural farms across the state, which fetch meagre daily wages. Their journey of more than nine hours that began on Monday was with the intention of thanking their lawyers. But just before they could return to Chhatrapati Shivaji Maharaj Terminus (CSMT) from Fort to catch a train back to Jalna, they allowed themselves a stopover at Marine Drive. “I will take my wife and son and visit my uncle and aunt in Bhiwandi. The rest will go back to our village. Our other family members, too, have been looking forward to meeting me since I was released. We will stay the night in Bhiwandi,” said Bapu. The six men, not as fit as they were 16 years ago, think it may be hard for them to find labour-intensive jobs. They are now counting on the compensation from the state government, as directed by the Supreme Court, which they are yet to receive. “Perhaps we will build a house, find some way of fending for ourselves when we receive the money,” said Rajya.